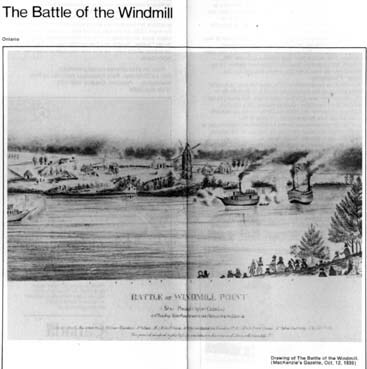 The Battle of the Windmill, November 12-16, 1838, was one of several invasions launched from the United States during the "Patriot War" which followed the unsuccessful Canadian rebellions of 1837. A largely American force of about three hundred men attempted to capture Fort Wellington in Prescott, cutting the St. Lawrence communications link and leaving the province open to invasion. The invaders were defeated by a combined force of British regulars and local militia. Eleven insurgents were hanged, some sixty others transported to penal colonies in Australia, and the remainder of those taken prisoner were released to the U.S. The British colony of Upper Canada was dominated by a small group of appointed officials in alliance with the Crown Governor, known as the Family Compact. The Rebellion of 1837 in Upper Canada was the culmination of frustration over political, religious, economic, and social problems which had arisen with the administration of the Family Compact. With the defeat of the rebels, many leaders, including William Lyon Mackenzie, escaped to the United States. Here, in the border states, they found general support for their goal of an independent, democratic and republican Canada. A secret para-military Hunter (or Patriot) Lodge was formed, and soon claimed considerable support. In November of 1838, the New York Hunters, led by the self-styled "General" John Ward Birge assembled at the Lake Ontario port of Sacket's Harbor for an attack on Fort Wellington in Prescott. The British had been alerted to the Hunter activities. 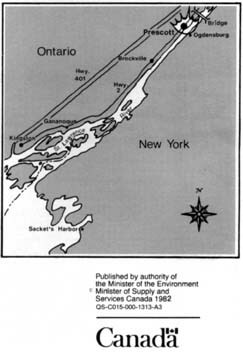 To protect the St. Lawrence, the local militia had been called out at Lancaster, Prescott and Gananoque. In addition, the reconstruction of Fort Wellington had been authorized. In the early hours of November 12, two schooners approached Prescott with the insurgent force. The invasion did not go according to plan. They tried to land at the Prescott wharf, but withdrew when the customs inspector, Alpheus Jones, sounded the alarm. In the confusion of withdrawal, one schooner became grounded off Windmill Point, one mile below Prescott. In order to lighten the ship and float her off, men and material were landed. At this point, "General" Birge, claiming sickness, retired to the American shore with about 100 men. 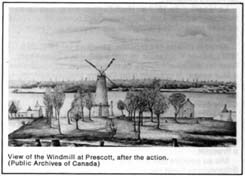 His promised reinforcements for the men landed at the Windmill was prevented by the vigorous action of the Experiment, a steamship from Brockville armed as a gunboat by the British, and the impounding of the insurgent vessels in Ogdensburg by Colonel Worth of the United States Army. was quick to see the strength of his position. The three and a half foot thick walls of the stone Windmill were impervious to cannon fire. Its 60 foot height gave a commanding view of the battlefield, and its windows provided effective firing posts for riflemen. The outlying perimeter of substantial stone buildings protected his flank. Von Schoultz had been led to believe that the local militia, and even some British regulars, would flock to his side. Instead, militia companies from the surrounding counties poured into Prescott to uphold the British cause. By the morning of Tuesday, November 13th, Colonel Plomer Young, a British half pay officer commanding the Prescott militia had a combined force of some 2000 militia and regulars. Leaving a force in Prescott under Captain Edward Jessup, they attacked in two columns, commanded by Colonel R. D. Fraser on the left, and Lieutenant Colonel 0. Gowan, on the right, supported by three steamships mounting eleven guns under Captain Sandom of the Royal Navy. The battle opened with Captain Sandom engaging the three insurgent field pieces in an artillery duel. Von Schoultz had advanced his men to defensive positions behind the stone fences bordering the fields in front of the Windmill. The superior numbers under Colonel Young gradually forced him back to the stone buildings. However, lacking ground artillery support Colonel Young was unable to dislodge them. The fierce rifle and musket fire had resulted in heavy casualties. Thirteen British were killed and 67 wounded, with an equal number of insurgents killed and 28 wounded. Leaving "picquets" to prevent the insurgents from escaping, Colonel Young withdrew his forces at about 3:00 p.m. His 28 prisoners were housed at Fort Wellington overnight, before being transferred to Kingston the next morning. The 14th and 15th were difficult days for the insurgents. They had no medical supplies, little bedding and inadequate food. The weather had turned cold, and a sleet storm added to their discomfort. Word of their plight was carried to Ogdensburg by a young insurgent named Meridith, who paddled across the icy St. Lawrence on a plank of wood. Colonel Worth, of the U.S. Army, suggested that Colonel Young allow the insurgents to withdraw to Ogdensburg. Young refused. Worth then allowed the steamer Paul Pry to cross to Windmill Point (while the British steamers were undergoing repairs). Contradictory messages were passed to von Schoultz. The first promised reinforcements, while the second pleaded for him to retreat. Confusion resulted, and the return of the British steamers forced the Paul Pry to withdraw without rescuing the insurgent force. By noon on Friday the 16th, Colonel Young had received additional reinforcements; four companies of the 83rd Regiment from Kingston, a grenadier company of the 93rd Regiment and a contingent of Glengarry militia just returned from routing a rebel force at Beauharnois, Quebec. The naval force now totalled three heavily armed steamers and four gun boats, while Major Macbean of the Royal Artillery arrived with a 12-pounder howitzer and two 18-pounder cannon on field carriages. Difficulties in unloading the heavy artillery delayed the final battle. In the interim, Lieutenant Colonel Dundas, now in command, held a meeting with von Schoultz under a flag of truce. He rejected von Schoultz's offer to surrender as official prisoners of war. Von Schoultz, unable to guarantee the safety of his prisoners any longer, turned them over to Dundas. By 3:00 p.m. Captain Sandom's vessels had opened fire. At 3:30 they were joined by Major Macbean's siege guns, located about 400 yards from the mill. Of the original insurgent force of about 190 men that landed, only 108 remained. Lacking ammunition for their cannon, they could only snipe at the advancing infantry with small arms. 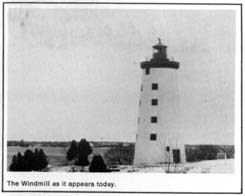 The windmill withstood the two hour bombardment with little damage. However, as darkness fell, the insurgents, recognizing the futility of their position, surrendered unconditionally. A few stalwarts refused to leave the farm houses, in which they had taken shelter. These buildings were burned by the British. British casualties were relatively light, as the battle had been conducted from behind strong shelters, and only two soldiers were killed. 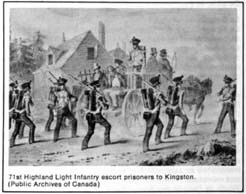 The insurgents were rounded up and taken to Fort Henry in Kingston. The large number of militia casualties and the reported mutilation of the body of Lieutenant Johnson of the 83rd Regiment, aroused public feelings, and only the intervention of British regulars permitted the safe transport of the prisoners out of Prescott. A total of 159 prisoners were captured by British forces. Of these eleven were executed; three died of wounds before coming to trial; sixty were convicted and transported to Van Diemen's Land, and the remainder were pardoned. 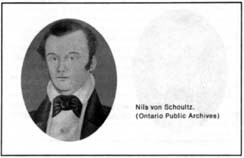 Von Schoultz, disregarding the advice of his advisor, a young Kingston lawyer named John A. Macdonald, pleaded guilty to the charge. While admitting he had been misled into believing that the Canadians were oppressed by the British, he claimed full responsibility for his actions. He was hanged at Fort Henry on December 8, 1838. Gallant to the last, his will provided 400 pounds for the widows and orphans of Canadian militiamen killed in the fighting. The fear of further invasions continued through 1839. A strong force was kept in Prescott, and work on Fort Wellington, then under reconstruction, was speeded up. In March 1839, 700 militia, under British officers, were garrisoned at the Fort. However, by the end of the year the "Hunter" movement had dissipated, and fear of a reoccurrence of these events faded. Brochure Design: Arden Baker Graphic Arts Ltd.